Adrants reader James Baldiga sends us this decidedly weird promotion for sleep drug Rozerem which features Abraham Lincoln, a talking beaver and a guy who can't sleep. The three explain healthy sleep and how the company's drug can put you to sleep when you can't do so yourself. Drug ads are boring. Sleeping pills are mundane. The combination of Abraham Lincoln, a talking beaver, a guy who can't sleep and a drug company promoting its sleeping pill are not. Yesterday, the Delaware Supreme Court ruled in favor of the American Legacy Foundation in a legal battle stating the Foundation's Truth campaign does not vilify or personally attack tobacco companies and their employees as claimed by the Lorillard Tobacco Company. While this certainly is a very good thing, we hope someone, anyone will get rid of the whole inane radical hipster-ish approach the Foundation has used in its recent campaign in favor of something...anything...different. Well, it's definitely not Numa Numa but, then again, time sheets are not that fun. These two German singers from Datebeat stopped by some German agency to do their rendition of "Time Reports." With the World Cup barely over, Russian agency Park has created an identity (unofficial) for the next World Cup to be held in South Africa in 2010. The identity wraps itself in the "speed, power and stamina" of the leopard, the symbol of South Africa. 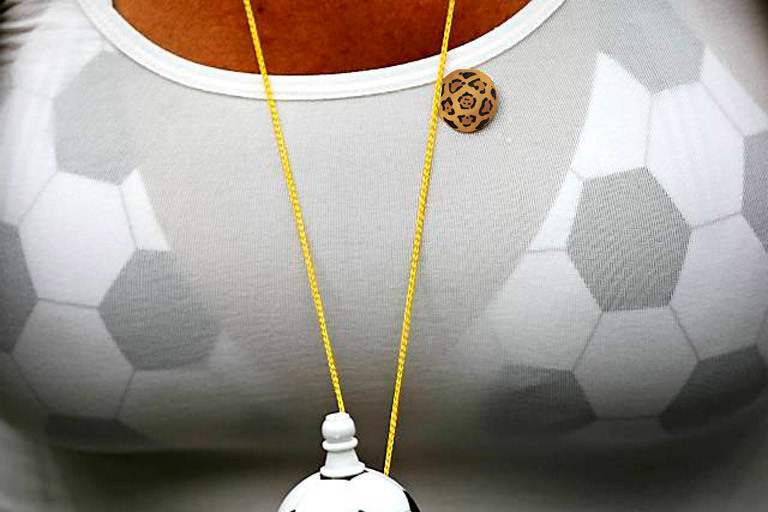 And yes, there is a specially designed football bra to hold round objects of a different sort. You can see the campaign identity here. Bud Light has created this Aborigine-like guy called Zagar and featured him on his own website and blog written by his "roommate," Steve. Videos on the site follow the the Crocodile Dundee-like, fish-out-of-water antics that come with cultural transplantation. Some of its funny. Some of its lame. The site has all the usual wallpapers, AIM icons and downloads and there's also a Flickr page and the very bloggy blog written by Steve which has all the required bloggy blog bells and whistles. So far, there are three posts that point to the three videos on the site. One wonders how long Bud Light will go to the expense of creating videos to foster blog content given that they are TV commercial quality. For the idiots in Oregon who can't tell the difference between glass, plastic and paper when recycling, Coates Kokes Advertising and production company BENT Image Lab have created two spots for METRO Residential Recycling. Hopefully, they'll get the point across. See the spots here and here. This Land Rover spot is actually pretty good but we had to watch it a few times to make sure the fast paced message drilled its way into our skull. The spot highlights the vehicles features in s manner that is far more interesting than some spokemodel pointing them out of some baritone announcer listing them off while the camera pans over the car doing these things all by itself. It just seems this spot puts a bit more reality into the car's features. Although, it's unclear just how long all those people could last stuffed into the vehicle. Unless you're a kid, there's not a vehicle out there that has seats other than the front that are all that comfortable for long periods of time. BBDO West has been busy lately and has just released two new pro-bono projects. The first is an anti-graffiti campaign for the city of San Francisco supporting the Mayor's Graffiti Abatement Program. The out of home campaign shows how certain graffiti can affect an environment with images of graffiti placed in people's homes. While comparing a public place to a private place might not be the best argument against graffiti, it does make the point strongly. The second pro-bono campaign was launched earlier this week for the San Francisco Zoo and consists of light poles transformed into giraffe banners. UPDATE: Several people have submitted spoofs of this campaign to street art site Wooster Collective. Continuing its wacky ways, Winterfresh is out with more weird creative from BBDO Chicago. This clip, called Porcupine Web, has something to do with a porcupine, a girl who does karate, ninjas, a DJ, cats and a guy who keeps saying "dang." Oh yes, and a happy ending that promises the girl she'll beat out the cheerleader and get the guy if she chews Winterfresh. Here's a collection of promotional clips for Studio Artois Live, a Stella Artois-sponsored UK outdoor film festival to be held July 22-23 in Greewich, amp up the film geek factor by filming people calling out continuity errors in movies such as Ferris Bueller's Day Off and Kill Bill. Some are funny. Some are not.